This project became the successor of Associative Search Machine (ASM) full-text web search engine project that was developed from 2006 to 2012 by IOIX Ukraine. As a network infrastructure and messages transport layer provider – the HCE can be used in any big-data solution that needs some custom network structure to build distributed high-performance easy scalable vertically and horizontally data processing or data-mining architecture. As a native internally supported full text search engine interface provider – the HCE can be used in web or corporate network solutions that needs smoothly integrated with usage of natural target project specific languages, fast and powerful full text search and NOSQL distributed data storage. Now the Sphinx (c) search engine with extended data model internally supported. AS a Distributed Remote Command Execution service provider – the HCE can be used for automation of administration of many host servers in ensemble mode for OS and services deployment, maintenance and support tasks. 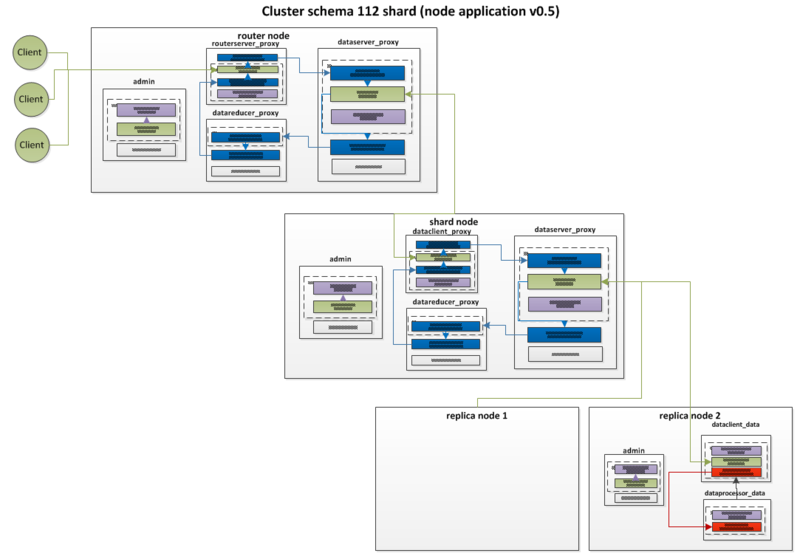 Provides hierarchical cluster infrastructure – nodes connection schema, relations between nodes, roles of nodes, requests typification and data processing sequences algorithms, data sharding modes, and so on. Provides network transport layer for data of client application and administration management messages. Manages native supported integrated NOSQL data storage (Sphinx (c) search index and Distributed Remote Command Execution). Collect, reduce and sort results of native and custom data processing. Ready to support transactional messages processing. Free network cluster structure architecture. Target applied project can construct specific schema of network relations that succeeds on hardware, load-balancing, file-over, fault-tolerance and another principles on the basis of one simple Lego-like engine. 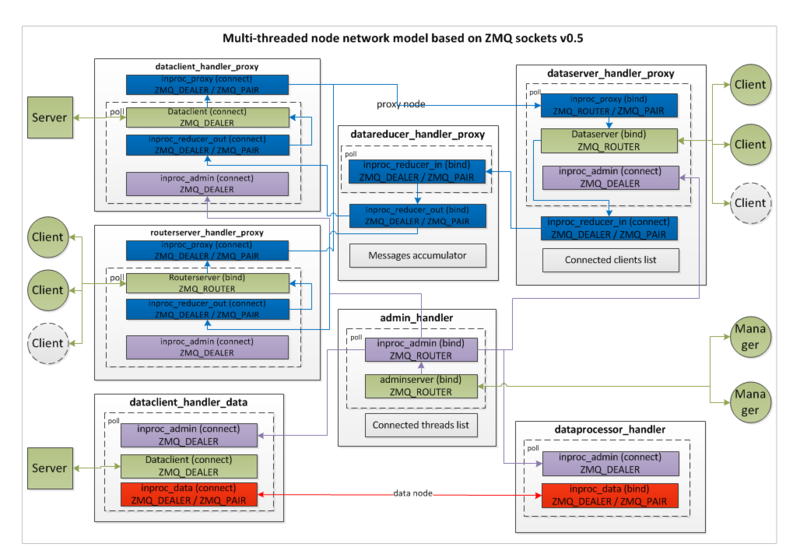 Stable based on ZMQ sockets reversed client-server networking protocol with connection heart-beating, automated restoration and messages buffering. Easy asynchronous connections handling with NUMA oriented architecture of messages handlers. Unified I/O messages based on json format. Ready to have client APIs bindings for many programmer languages covered by ZMQ library. Can be easily integrated and deployed. The heart and main component of the HCE project it is hce-node application. This application integrates complete set of base functionality to support network infrastructure, hierarchical cluster construction, full-text search system integration and so on, see “Hierarchical Cluster as engine” main points. Implemented for Linux OS environment and distributed in form of source code tarball archive and Debian Linux binary package with dependencies packages. Supports single instance configuration-less start or requires set of options that used to build correspondent network cluster architecture. Supposes usage with client-side applications or integrated IPI. First implementation of client-side API and cli utilities bind on PHP. Router – upper end-point of cluster hierarchy. Has three server-type connections. Handles client API, any kind of another node roles instances (typically, shard or replica managers) and admin connections. Shard manager – intermediate-point of cluster hierarchy. Routes messages between upper and down layers. Uses data sharding and messages multicast dispatching algorithms. Has two server-type and one client connections. Replica manager – the same as shard manager. Routes messages between upper and down layers uses data balancing and messages round-robin algorithms. 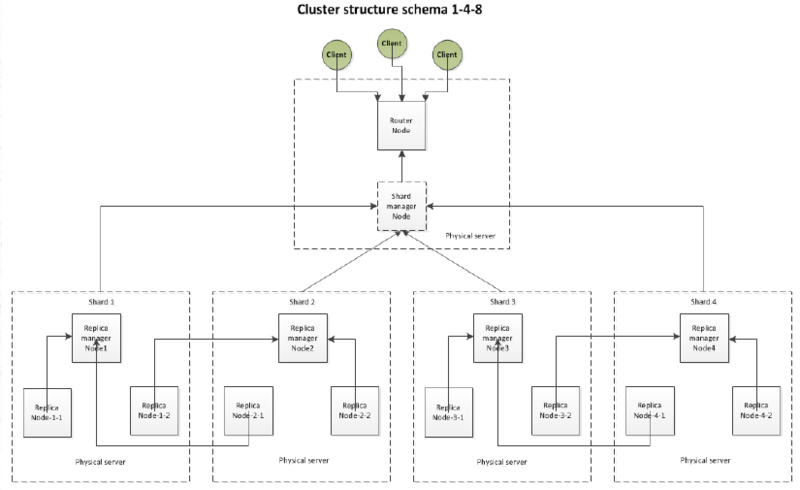 Replica – down end-point of cluster hierarchy. Data node, interacts with data storage and/or process data with target algorithm(s), provides interface with fill-text search engine, target host for Distributed Remote Commands Execution. 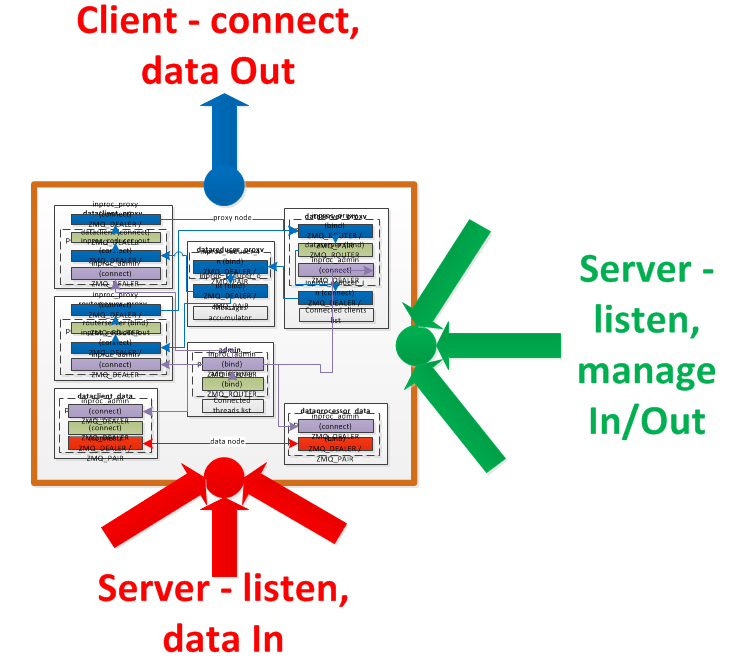 Has one server- and one client-side connections used for cluster infrastructure Also can to have several data storage-dependent connections. This is just one example of four level cluster structure. This structure can be used to create four hosts distributed data model solution to split one huge documents storage on three physical host servers and utilize all CPU and I/O resources in effective way. Each level uses different data distribution modes (shard or replica). Two replica nodes of each shard balances requests and have complete mirrored data. Shards are multicasted and requests results accumulated and reduced by shard manager node. Smooth transparent aggregation of several different indexes and search algorithms in federated search. Native support by file operation the run-time indexes attach, copy, replace, swap, mirror, merge. Native support of indexes sharding and mirroring according different data schema. Extended full text search queries including full match, pattern match, set of fields match, logical operators, proximity limits, stop-words lists and many other provided by regular Sphinx search (c) engine. Filters for numeric fields including exact match and range comparisons. Multi-value numeric fields, bit-set and logical operations simulation in search query. Custom order including Sphinx full text search weight and custom weightier calculation algorithms definitions like SQL ORDER BY prioritized fields list or more complex logic. ZMQ (c) sockets for inter-process and in-process interactions. POCO C++ framework (c) for application architecture and algorithms including json and xml parsers, objects serialization, configuration settings and many other. Sphinx search (c) engine client native integration with extensions. Mutex-less multithread application architecture and messages handling. Strict C++ OOP design, including elements of 11 standard. Open source distribution in source code of tarball archive. Binary Debian Linux native packages separated on HCE-node and utility packages as well as complete full meta-package. Dependencies libraries packaging and maintenance to complete cover dependencies and make installation smooth. Public repositories accessible for contributors community. Upgrade dependency packages and libraries as part of product. Box ready to start distributive with Demo Test Suit (DTS) with examples of simple cluster structure to start full text Sphinx-based search right after installation. The HCE cluster networking uses MOM-based pattern, so is ready to be transactional. The transaction model now under progress of research. 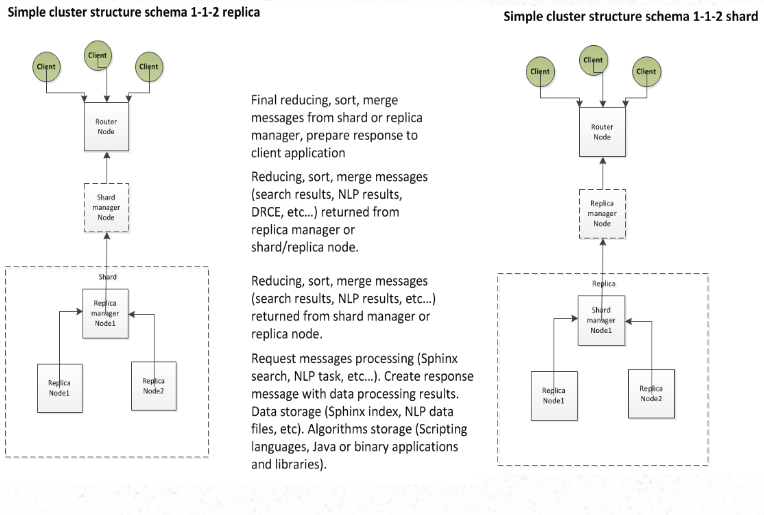 The cluster structure is hierarchical and infrastructure can be complete redundant. All user’s data like Sphinx Index, document files, configurations, source codes and so on that are stored on data nodes can be redundant or mirrored using internally supported replications or user-defined algorithms of applied applications that uses HCE engine as service. For cluster infrastructure node networking uses ZMQ PPP pattern with extensions. This network pattern supports heart-biting, but extended with automated reconnects and connections management. This helps to have the stable auto-recovered channels as well as to build several kind of management under the cluster infrastructure to have dynamic structural changes, extensible and near real-time scalable multi-host architecture. The node of any role and mode does not stores unrecoverable data in memory, but only messages that is under process of sending/receiving. This provides the possibility to be safe and to lost minimal important data in case of node application crash. The instance of node application takes minimal amount of RAM and minimal CPU resources as well as has no big files on disk that belongs to the application specific functionality. All another user’s data can be redundant on the basis of applied target user-level algorithms and functional logic. Additions and extensions to support transparent configurable transactional model for all kind of actions. Extension of data node with native support of another index types and data storage like SQLite. Extensions with set of API and utility tools for creating typical cluster structures and sharding models. Extensions with set of API for general management and tracking of statistics, including web-UI for state visualization and visual management. Extensions for statistics and logging data analysis and visualization.